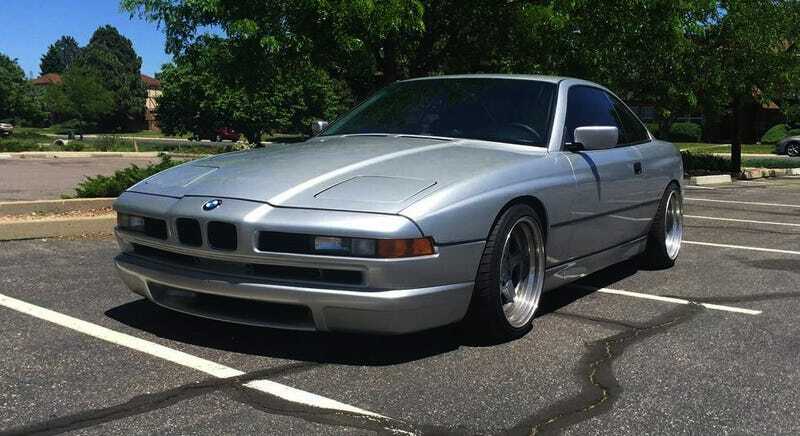 For $21,500, Could This 1991 BMW 850i Six Speed Be Perfection? The seller of today’s Nice Price or Crack Pipe Big Bimmer claims it to be near perfection. That’s pretty hard to achieve, and so let’s see if this silver bullet’s price lives up to that purple prose. Do you ever feel bad for a car? You know, one that seemed to be built out of nothing but good intentions but just sort of missed the mark, or was was metaphorically left on the bench when kickball teams were picked in second grade? That’s exactly how I feel about yesterday’s 1992 Cadillac Allante. For no fault of its own—well, okay, some of the early models were pretty faulty—the Allante suffered an ignominious fate. That of course means that today prices on even nice examples are in the cellar and that’s probably why we all awarded this one a narrow but respectable 54% Nice Price win. Okay, now I feel better. You know what would make me feel even better? That’s right, a BMW 850i in Deutschland silver. You know what would send me over the moon? Yep, that would be if that big Bimmer were to have a snickerdoodle six-speed stick too. As you can imagine, I’m pretty stoked right now. To be honest, I’d actually like to have the 850s less cylinderiffic brother, the V8-powered 840. That lighter car offers better handling, a less inscrutable mill, and fuel economy numbers that kindergarteners might not be able to count to. That car however lacks the buttery smooth (when it’s working right) experience that is the BMW M70B50 five-litre, 296-bhp V12. Seeing as BMW’s forte has always been straight six engines, it may come as no surprise that their 12 is in fact a pair of conjoined sixes, with separate throttle bodies, ECUs, and in all likelihood, hopes and dreams. That makes the engine a bit of a bear to maintain. Lucky for us then that the seller of this 1991 E31 describes it as near perfection. If you’re going to go with something as complicated as the space shuttle you better go for the best you can find. This one rocks 100K on the clock and a black leather interior from back when BMW really knew how to do interiors. Seriously, look at it! In there you’ll find a new M Sport wheel, shift knob and handbrake snood, as well as some fancy covers for the pedals. On the outside you get a CSi front valance and some 18-inch Schnitzer alloys that perhaps don’t do the car any favors. Thankfully, the factory BBS baskets are included with the car and you can probably recoup a bit by selling the Schnitzers to a Brah that will dig slapping them on his slammed E46, offset be damned. The car comes with a clean title, tidy CarFax, no history of accidents, and Bilsteins behind the Schnitzers. Near perfection, right? Well, let’s get beyond the seller hyperbole shall we? Moving away from that claim of total nirvana are the issues with the LED license plate lights messing with the bulb monitoring system, a wonky driver’s seat rail—still works, but only when you do the work—and the aftermarket stereo which needs an ignition suppressor or something to counter the whine. Other than that, sign me up, right? Well, let’s get to the matter at hand, which is the car’s $21,500 asking price. That’s a lot of samolians, but keep in mind that this car is equipped in much the same manner as the contemporary (1992-1997) Ferrari 456GT. Sure, the Italian has a LOT more ponies under its hood, but right now they tend to go for more than three times this car’s asking price. Plus, the 850 is a far better looking car than the 456, IMHO. With that in mind, and shoving to the back of your brain the obvious complexity of the car that’s going to cost something like a house payment down the road, what’s your take on this ‘near-perfect’ example and that $21,500 price? Does that seem like a deal for a six-speed V12 super coupe? Or, is that just too big a price to put on perfection? H/T to Erik for the hookup!